"This month's plans" offers you some ideas to visit and feel at peace during your stay as well as enjoy seasonal events in Kyoto. They are mostly in outdoor, including some mountains, so that you can enjoy a green and healthy stay and save money as well! This is one of recent-started biggest events of Kyoto in winter. The high season of a travel destination Kyoto is spring and autumn and during these season many tourists are crowded anywhere in Kyoto. However, after these season passing, the town suddenly gets quiet. I like this normal life atmosphere, but it is a terrible season arriving for travel industry and hotels. Thus, actually, this event was planned to attract tourists for cold season as well. 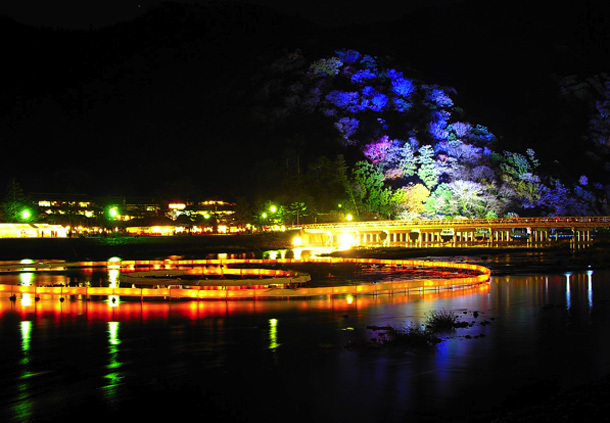 The outline of this event named “Arashiyama Hanatoro” is like below. About 5km of the road between Togetsu-kyo Bridge and Nison-in Temple in Arashiyama will be illuminated with 2500 lanterns and decorated with some Ikebana displays. Some Temples and shrines are specially opening at night time (Tenryu-ji Temple, Hogen-in Temple, Nishon-in Temple, Horin-ji Temple, Nonomiya Shrine, Jojyakko-ji Temple, Rakushisha Building, Okochi-sanso Garden and Shigureden-hyakunin-isshu Museum). 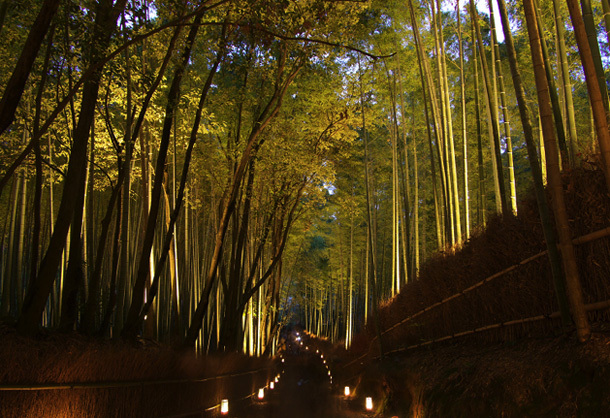 It sounds fun by the way..
No doubt that the illuminated bamboo forest is breathtaking. Walking between bamboo trees is the best place and timing for selfie!